We offer a great airport travel service here at Manchester Minibus Hire that goes above and beyond our regular services and includes a number of different airports from across the UK. We know how stressful getting to and from an airport can be and we look to make the transition to your holiday as smooth as possible. 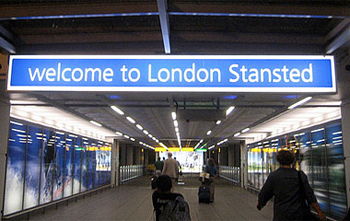 To that end London Stanstead airport is one of the airports that we offer a minibus service too. Stanstead Airport is one of the airports in and around the greater London area and while it doesn’t have the grandiose nature of its big brother Heathrow, it is still a major travel hub for the UK and a large international airport that sees a lot of traffic. popular choice for people looking to travel on a bit of a budget. People like that are also people we’re interested in catering too. A lot of people will avoid taking their own car to the airport when they are leaving for holiday. It would require leaving your car there at the airport. This is possible but it is also risky for your car and not as safe as leaving it at home in a garage. It is also costly to leave your car in an airport like that and overall something like a minibus is a lot cheaper and a lot easier to deal with. We’ll even be there for you when you return. You have the option of booking a return journey through us to get you back home safe and sound after your holiday, taking away another big stress of the holiday process. If you book a return trip then we will monitor the arrival of your flight and make sure to send someone out to pick you up. Our service is friendly and reliable. We’ll always be there when you need us and our drivers are among the most professional there are.